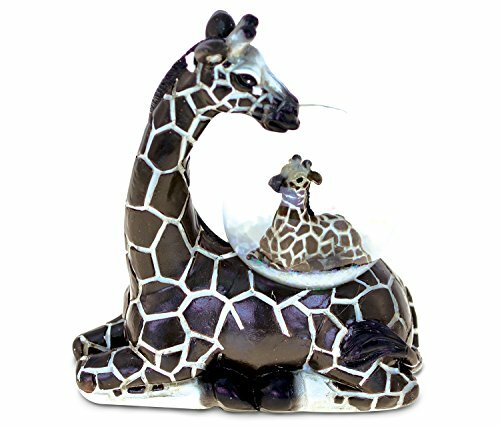 This Giraffe Mom And Child resin stone finish snow globe was meticulously handcrafted and is part of our wild snow globe collection made of glass and with a resin stone finish. This museum-quality handcrafted keepsake is a collectible craft. Shake it up. Gently hold and tilt this mother and baby giraffe globe and you will see the relaxing beauty of the snow churning up. Perfect for a gift! A UNIQUE HANDCRAFTED KEEPSAKE. This masterpiece was meticulously handcrafted and is part of our wild snow globe collection made of glass and with a resin stone finish. This is 45mm and approximately 3.9 inch tall. SHAKE IT UP. Gently hold and tilt this Mother and Baby Giraffe globe and you will see the relaxing beauty of the snow churning up. Perfect for a gift. START COLLECTING NOW. It often starts as a souvenir from special events but ended up as a collection to some. IT GIVES RELAXATION. Snow globes light up the scene because of it's enchanting features inside.